How can B2Bs Prepare for eCommerce Peak Period? To get the low-down on what it takes to achieve peak period success for our recent whitepaper, we spoke to five experts for their hard earned pearls of wisdom. Amongst their number was David Pert, eCommerce Director and the pro at the helm of leading uniform provider Simon Jersey’s eCommerce exploits. Dani has the lowdown! 2016 was a particularly significant year for the fashion brand, who won the contract to supply Team GB for the Rio 2016 Olympic Games. The company kitted out the nation’s athletic heroes in their outfits for formal events during the Games, including the closing parade. 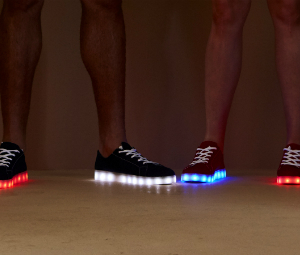 Yep, you read that right – remember those amazing flashing trainers? That was Simon Jersey’s handy work. The eye-catching, flashing red, white and blue sneaks captured the attention of the hundreds of millions watching the night’s entertainment unfold on their screens around the world, and resulted in a surge of traffic flooding the brand’s site. David told us a little about how one night in Rio affected the brand. He said: “Following a fantastic reaction on social media to officially supplying Team GB with formal wear and parade wear, we’re keen to thank our customers by allowing them to play a part in which promotions we offer throughout Black Friday week. So, Black Friday and Cyber Monday aren’t just for the likes of Amazon and Apple? With the recent roll out of eCommerce platforms such as Magento 2 that cater specifically for the omnichannel experience, shoppers now expect as par for the course, David gave us his thoughts on how retailers can use this technology to their advantage in the lead up to the peak periods. “There’s definitely a trend towards the centralisation of transactional and behavioural data and how that can be used to trigger, automate and inform marketing activities. As a result, many digital marketing tools which used to be separate from the eCommerce platform itself are becoming a part of the core offering. To round things up, we asked David how closely did they worked with their hosting provider leading up to the event. “This year has seen a step change in how we approach our relationship with UKFast. It’s clear that sharing our strategic goals is leading to significant improvements in resource efficiency, stability, cost effectiveness and customer experience. To get more of the inside track from the masters of eCommerce peak period success, download the whitepaper here.